The Panasonic MA73 is the latest addition to the top selling Real Pro Ultra line. This incredible massage chair retains a lot of the great features from the EP-MA70 but has added technology and kneading programs. If you liked the MA70, you’ll like the MA73 even more. Panasonic is a brand that is known internationally. It was formerly named Matsushita Electric Industrial Co. The company was founded in 1918 and has been providing quality electronic products ever since. 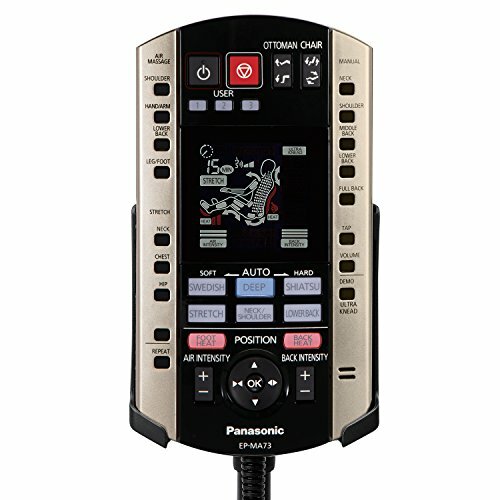 The Panasonic EP-MA73 comes with synthetic leather upholstery. It has an upright dimension of 45.3H x 37.4W x 48D inches and a reclined dimension of 26H x 37.4W x 79.6D inches. The ideal height range for this product is from 4’10” to 6’3”. Panasonic provides a 5-year warranty for all of their massage chairs including this one. During the first 3 years, they will service the parts and labor without cost but in the remaining time, customers will shoulder the labor while parts remain free. Take note that only the electrical components and massage block are covered. Sophisticated 3D Massage Roller – This hi-tech massage chair comes with very humanistic massage rollers, possibly the best on the market. They work like a simulated human hand. Heated Massage Rollers – The Panasonic EP-MA73 tries to simulate warm hands. Imagine yourself being massaged by a professional masseuse. You can even fine tune the intensity by choosing from 3 settings. 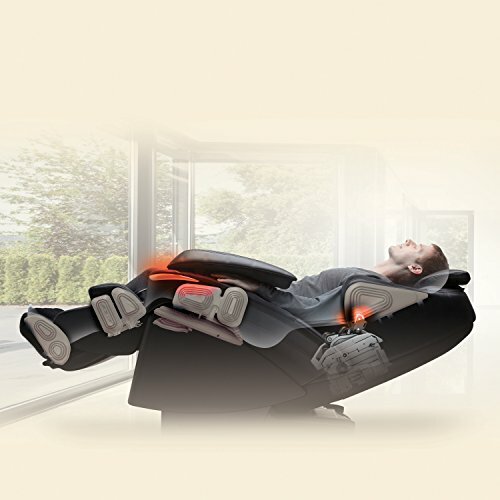 Junetsu Massage – This is an exclusive Panasonic massage chair feature. The Panasonic EP-MA73 also comes with this feature wherein your muscles quickly loosen up. This helps in relieving stiffness and promotes better body movement. Body Scan Technology – This feature uses advanced pressure sensors to make a virtual map of your back. As the chair scans the body, it also performs a massage that matches the curvature of your spine. 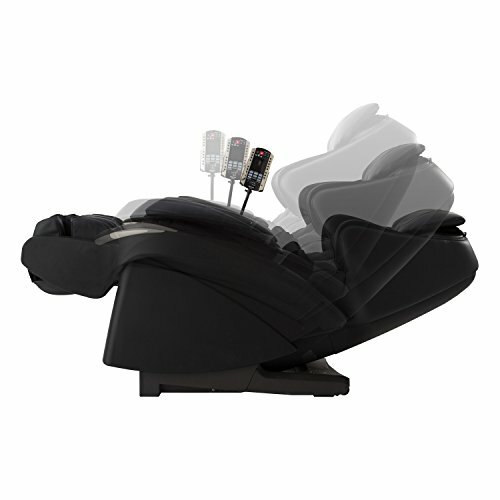 Air Compression Massage – This model contains a 33 airbag compression system. 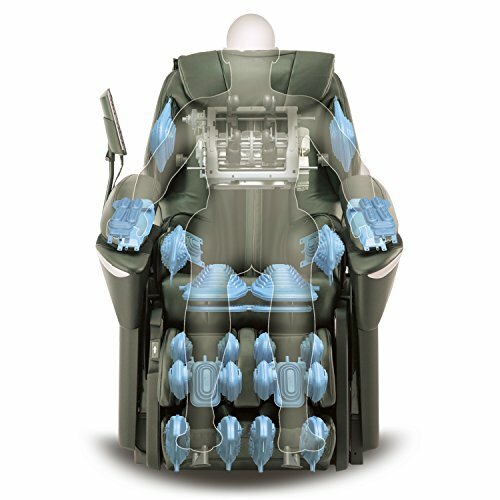 These airbags are specifically placed and designed to target the key parts of the body in order to provide the ultimate massage. You can choose to turn each region on or off and it also comes with 3 intensity levels to choose from. New Palm and Arm Massage – The Panasonic EP-MA73 massage chair comes with armrests that pop up. These armrests have airbags. As you recline, the armrests adjust and allow you to even get an arm massage even if you are lying down. Automatic Programs – You can choose from 6 preset automatic programs, namely: Deep, Refresh, Hip, Lower Back, Neck and Shoulder, and Shiatsu. Manual Programs – You can also opt to create your own program by using 6 manual modes namely: Rolling, Swedish, Kneading, Shiatsu, Tapping, and Junetsu Ultra Kneading. It’s a bit of a struggle writing the pros and cons of this chair because the MA73 is basically the older model (MA70) with some tweaks and enhancements built in. Because this model is basically the MA70 at its core, the pros and cons remain the same. I’m inclined to be lazy and just tell you to read my previous MA70 writeup. However, let’s assume that you haven’t read the MA70 review. If you’ve been following our massage chair reviews, you’d know that we are biased for Japanese-made massage chairs (or any product, for that matter). They simply last that much longer and have the best cutting edge technology. This line of Panasonic massage chairs is no different. According to Alan Wiedner, our favorite massage chair expert, the Panasonic EP-MA73 has a failure rate of just 1%. This is outstanding by massage chair industry standards. We mentioned cutting edge technology. How many massage chairs have you heard with heated massage rollers.? Not too many. None come to our minds. Heated rollers bring your massage experience to another level. It simulates the feeling of massage by human hands even more and is absolute heaven in cold weather. And here’s another surprising thing. It’s got jade stone rollers that get heated up by little heating units in the chair. They feel wonderful rolling up and down the length of your body. We sang the praises of the MA70’s excellent massage features. We thought it couldn’t get any better but apparently, it can because its Japanese engineers managed to improve the tech on these chairs even further. Junetsu is a Japanese word for “ultra fine kneading”. The term refers to the movement of professional massage therapists wherein they knead the patient’s muscles with one-second circular motions with their thumbs. In the Panasonic EP series, small thumb-like mechanisms knead the user’s muscles horizontally and vertically to remove tension from the body. There are basically two types of people when it comes to the intensity of massages — those who like their massages soft and soothing, and those who like it really deep and hard. If you are the latter, then we highly recommend this series. Now, here’s another awesome thing. You don’t get stuck with just the hard massage intensity. 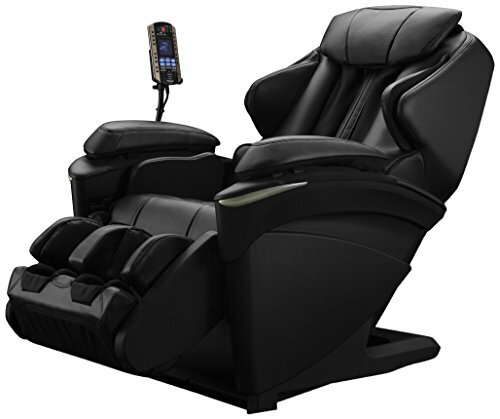 If you want variety or there are days wherein you need a softer massage, you can customize the MA73. This chair’s engineers added a gradient scale on the remote control so that you can choose softer intensities. This is definitely a huge plus for design and usability. Here’s another feature that most chairs don’t have but should have — memory function. Similar to the MA70, you can save up to 3 programs so that you can immediately choose the saved program you want. This is very useful if you have specially customized programs for specific scenarios. A lot of users of both the MA70 and MA73 experience a decrease in any body pain they have been suffering from. I attribute this to the superior massage technology we discussed at length AND the stretch program available on these chairs. The stretch program mimics the adjustment that one can get from a session at the chiropractor’s. In the MA73, the stretch program involves the pelvic, back, and the neck areas. The seat drops while rollers position themselves under the skull to keep it in place. The shoulders are pinned in place by airbags and the back is stretched. Now caters to taller people; the difference is 2-4 inches more from the MA70’s max 6’1″ height. If you are looking for a budget chair and you only have a couple of thousand bucks, then move on. This chair is not the most expensive out there, but it is still very expensive. This massage chair can incline up to 170 degrees. Just ten degrees more and it would be a zero gravity chair. It’s a puzzle why it wasn’t made into a zero gravity chair. The only thing I can think of is that it may interfere with some of its current design and features. If you ask us for the best chairs we can recommend you and tell us that you have the money for it, we’d be pointing you to models such as the iRobotics AND these two — the MA70 and the MA73. The Panasonic EP series is very solid in design and features. It will last you a very long time while giving you a superior and comprehensive massage experience. If you want to save a bit, go for the MA70. However, if you can afford the additional thousand bucks, go for the improved and upgraded model – the MA73. You’d be joining the ranks of satisfied buyers who have no complaints about their purchase.